Carrollwood, Florida - Instead of screening and set play, dozens of youth soccer players were greeted by a Hillsborough County Sheriff's deputy as they showed up to play soccer at the Plantation at Carrollwood Saturday morning. Apparently, the Plantation Youth Soccer Club and its 300 young players are no longer welcome in the deed-restricted community. 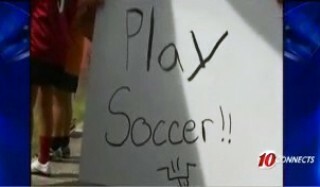 "We're supposed to have a game today," said one player as he held a sign near the entrance of the community. He and dozens of other players and parents protested for three hours at the community's entrance. "We found out yesterday that the manager wouldn't let us play soccer," another player said. Friday night, league director Tony Rivera confirmed the community's manager called him with the news. 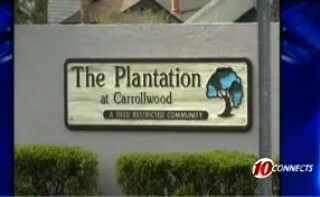 While asking to speak with the manager of the Plantation at Carrollwood on Saturday, 10 Connects was asked to leave the property. But a homeowner's association board member said the decision was based on a letter from the HOA's attorney. "The attorney for the association said his record check for submitted papers showed that the soccer league as a corporation was dissolved on March 15, 2010," the board member told 10 Connects as he read the letter. Rivera doesn't dispute that and says the league recently changed its name at the association's request. The league is now called the Plantation Youth Soccer Club and has a $1 million insurance policy that has been in effect since March 10th, according to Rivera. Parents are now asking neighbors to sign a petition and plan to attend a board meeting on Wednesday, April 21st at 7 p.m at 11380 Brookgreen Drive. About 60 percent of the parents in the league also live in the deed-restricted community. "What am I paying them for?" one parent said in exasperation.